In case I don’t get around to baking cookies today, here’s another recipe from yesterday. I was embarrassed to post that I actually made two batches of cookies just for myself, but I wanted something oatmeal to go with the chocolate. So here’s the other batch. I halved it, ate a few and sent the rest to work with Todd. Speaking of sending things to the office with Todd, the last thing I sent in was a weird concoction of pretzels, fritos and peanuts held together in a matrix of butter, brown sugar and chocolate – kind of a perverse spin on the old “Cracker Candy”. I sent it in with mixed feelings. On one hand, it looked completely disgusting because I didn’t crush up the Fritos and pretzels enough. On the other, I couldn’t stop eating it. Todd told me later that it disappeared in two seconds. I need to revisit that recipe, but it’s kind of dangerous. So here’s something more traditional. This is from one of my favorite books, The Good Housekeeping Illustrated Book of Desserts. Place first 6 ingredients in a large mixing bowl. Beat for 10 minutes with an electric mixer, scraping bowl occasionally. 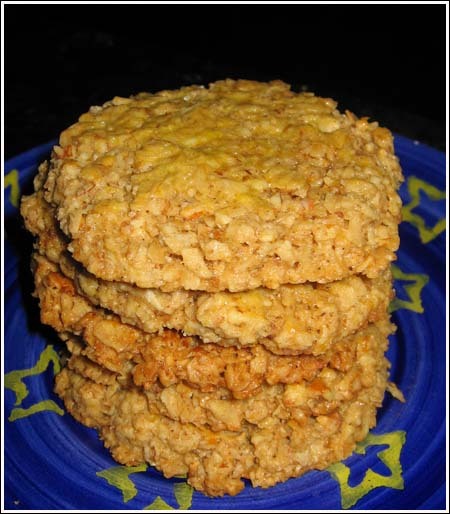 Add oats and almonds; stir until well blended and mixture holds together – it will be kind of crumbly. Preheat oven to 350 degrees F. Line 2 large cookie sheets with parchment or Release foil or Silpats. Between two sheets of waxed paper, roll out half of the dough. Using a 2 ½ inch round cookie cutter or rim of a glass, cut as many cookies as possible and space them 1 inch apart on cookie sheets (they won’t spread much). Brush tops with egg yolks. Repeat with remaining dough. Alternatively, you may just mash the dough directly onto the cookie sheet, cut out circles, and pull remaining dough off. Bake cookies 12 minute or until golden. For crisper cookies, bake 14 minutes – check at 12. Remove from cookie sheet and set cookies on a wire rack to cool and crisp. Note: I took a few off the tray after 12 minutes, turned off the heat in the oven, then put a few cookies back in the oven. I closed the door and let them cook with the oven’s residual heat. They stayed there for about an hour (I forgot about them) and when I took them out, they were a little browner and very crispy. I actually liked them that way! So if you want these to be really crispy, you could give that a try. Another variation I think would work is to omit the lemon, add a bit of vanilla and use Nestle Toll House Miniature Chocolate Chips (the tiny, tiny ones). They actually do make a device that stirs constantly. It didnt get very good reviews though. Have you ever tried oven baked risoto? Its very good, easy and still tastes like traditional risotto. Those oatmeal cookies look so good! It sounds like everyone wants the Frito recipe. I just love salty/sweet combinations. This Old House is in Austin TX. It looks like a great city. You are lucky to live there. That Frito/Pretzel/peanut concoction sounds good! It sounds like something fun to do with the kids. Chloe, maybe I’ll email it to you. It needs something, still…but I can’t figure out what. Jackie, the baked fudge was just not what I expected. It set, but it was too rich — like eating underbaked brownies or something. I’m not a food snob, but this just wasn’t worth the trouble. These look great. I can’t wait to try them. What happened with the baked fudge? I want that Frito/Peanut Butter recipe!! Is it on the website or will you share! ?